Fifteen years ago, in a manner befitting their name Solas burst onto the Irish music scene and instantly became a beacon – an incandescent ensemble that found contemporary relevance in timeless traditions without ever stooping to clichés. Anchored by founding members Seamus Egan (flute, tenor banjo, mandolin, whistles, guitars, bodhrán) and Winifred Horan (violins, vocals), Solas is rounded out by Mick McAuley (accordians, low whistle, concertina, vocals), Eamon McElholm (guitars, keyboards, vocals), and newest member and lead singer, Niamh Varian-Barry. 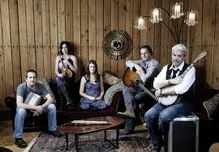 Through fresh and unexpected arrangements of age-old tunes, compelling and topical originals and covers, and unparalleled musicianship, Solas continues to define the path for the Irish music world and drive the genre forward. With ten albums under their belt, Solas’ band leader Seamus Egan was inspired by his family history to create Shamrock City – their most ambitious project to date. Shamrock City tells the story of Butte, MT, a mining town at the turn of the 20th century, as seen through the eyes of an Irish immigrant and Seamus’ great-great uncle, Michael Conway. In 1910 he sailed from Cobh, Co. Cork in Ireland to Philadelphia and then made his way to Butte to work in the copper mines. Six years later, at the young age of 25, he was dead from a blow to the head. With audio recorded in Philadelphia and film footage in Butte, Shamrock City seeks to not only uncover the life and young death of Conway, but to also illuminate life as an immigrant during the Industrial Revolution.